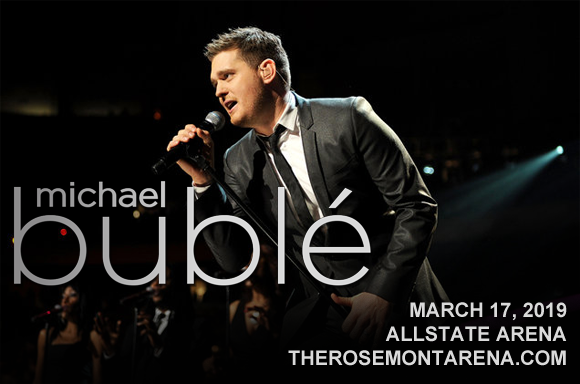 The suave and sophisticated pop of Michael Buble wings its way to Allstate Arena on Sunday 17th March 2019 in the form of the Love Tour! The ever-charismatic, Grammy Award-winning singer is putting on a brand new show after two years away from music, and he's back with a message of joy! Performing songs from Love, his newest album, as well as some of his cherished older hits, Buble is always an utter delight and a true showman live – grab your tickets now! Since his first foray into the music scene in the late 1990s, Canadian singer, songwriter, actor and record producer Michael Bublé has sold over 75 million records worldwide and has become a highly awarded artist, with four Grammy Awards and thirteen Juno Awards among many others. Bublé began his career singing in nightclubs as a teenager, and at the age of eighteen he secured his first agent. Bublé spent several years working hard as an entertainer, singing in clubs, conventions, cruise ships, hotel lounges, shopping malls, and talent shows, before his big TV break. After a few acting jobs on Death Game (aka Mortal Challenge) and The X-Files, Bublé was asked to fill in as a singer on the Vicki Gabereau national talk show on the CTV network when another guest cancelled last minute. Bublé's appearance in the first season led to many more on the show, and he became a regular guest. After self-releasing three albums: First Dance, 1996; Babalu, 2001; Dream, 2002, Bublé was signed to multi-Grammy Award-winning producer David Foster's label, through a series of unexpected events involving Prime Minister Michael McSweeney. Bublé's self-titled debut studio album was released in 2003 and was an instant Top Ten hit in Canada and the UK. To date, Bublé has released eight studio albums, including three consecutive Billboard 200 number-ones. In 2018, he released his latest album, Love.